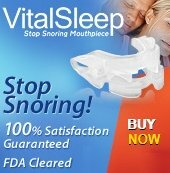 There are a variety of anti-snoring devices available; however, there is no definitive cure for snoring. The following are some of the most popular devices on the market, how they work, and the pros and cons of each. Be sure to talk with your doctor about your snoring and how to most effectively address your condition for better, more restful sleep. Oral appliances are dental mouthpieces that fit in your mouth like removable orthodontic retainers or sports mouth guards. They are used to treat snoring and obstructive sleep apnea (OSA). Oral appliances hold your tongue and lower jaw forward to make more space for breathing and prevent snoring. Some side effects of using oral appliances include dry mouth, jaw discomfort, and excessive salivation. If you use an oral appliance, have it checked by your dentist every six months for the first year and at least once a year after that to ensure that it continues to fit properly. Nasal strips are adhesive strips that you apply to your nose. They purportedly prevent nostril collapse, increase the area of the nasal passage, and enhance your breathing. Nasal strips are generally only effective for people who snore lightly and occasionally. Some snore pillows are designed to relieve throat pressure and open the airway, while others raise your upper body and prevent you from sleeping on your back, a position which makes you more prone to snoring. Snore pillows may help some people who snore, but not everyone. Chin straps prevent your mouth from falling open while you sleep and help you breathe naturally through your nose. They also help people who use CPAP machines prevent sore throat, dry mouth, and other uncomfortable side effects. The downside of using chin straps is that they are fragile and can irritate the skin. CPAP machines are commonly prescribed for individuals who suffer from obstructive sleep apnea, a serious condition that can result in cardiovascular issue, stroke, high blood pressure, and a number of other life-threatening health conditions. CPAP machines feature a pressurized mask, which you wear over your nose while you sleep. The mask provides a steady stream of air, keeping your airway open while you sleep. There are a variety of different types of CPAP masks and machine models to address individual needs for breathing therapy and comfort while using CPAP equipment. If you see a doctor about your snoring, he or she will likely perform a range of tests to pinpoint the underlying cause of your problem and then suggest a few lifestyle changes. If making these changes doesn’t eliminate your snoring, your doctor will probably recommend certain medications, one of the anti-snoring devices above, or even surgery, depending on the specific cause of your snoring. However, not all remedies are suitable for everyone who snores and you may have to try several remedies before you find something that effectively eliminates your snoring.